My friend and I always give each other food on our birthdays. It doesn’t matter if we, like the last two years, are swamped with Homecoming and AP testing. Or that we’re not best friends anymore. We started this tradition in middle school, probably four years ago, and still make sure that food makes its way to the other person’s hand and mouth. This year, I decided upon Samoa bars. I was originally planning to do Samoa cupcakes, but cupcakes are a pain to transport so I switched to bars. I have a distinct memory of her liking the Girl Scout Samoa cookies (you know, the ring-shaped cookies with golden coconut and chocolate drizzle; if you’re still lost, I pity your childhood and look here please for a reference). This inkling originated in elementary school, mind you, so I wasn’t quite sure it would still fly. But I saw her eat those delicious Trader Joe’s Roasted Coconut Chips (please go out and buy some. You will eat the package in 5 minutes tops.) in physics class a couple of weeks ago. Coconut is the most controversial ingredient in the bars, so I figured the bars would be enjoyed. Anyways, these were pretty easy to make. It was nothing I hadn’t made before (the caramel/coconut layer was pretty similar to the one I made for the German chocolate cake). However, the overall product was significantly more time-consuming than I had originally thought, due mostly to the fact that there were three separate components to be made. I made a bunch of small modifications to the recipe. I didn’t have any parchment paper, so I buttered the pan liberally. The shortbread was pretty buttery, so it wasn’t a big deal. I baked the shortbread until it was nice and golden, about 20 minutes at 350F and 2 minutes at 375F due to my impatience. I didn’t use any salt. I bought ingredients last minute, and didn’t have time to go to multiple stores. Trader Joe’s only had fleur de sel caramels (wow, that sounds like such a sacrifice), so I figured I’d compensate with leaving out other salt. I used 2 ounces less caramels then called for and used less milk as a result. I kept the 3 cups of coconut, so the caramel/coconut layer was less caramelly/liquidy than I would have liked. It made it harder to spread over the shortbread as well. I used a mix of flaked and finely shredded coconut, toasted at 375F for 4 minutes while I tossed occasionally. I probably could have and should have toasted longer, since it was still a bit white and pale, but I didn’t want to burn it. I think the most annoying part of the whole process was waiting for the shortbread to cool completely before smearing the caramel/coconut layer on top. It was 10pm, I was tired, and all I wanted to do was crawl into bed. But nope, the shortbread wanted to take its sweet time to cool. I threw in the towel half an hour after it came out of the oven and spread the warm caramel over. I used a different ganache recipe, since even I thought heavy cream and butter was a bit much. I used 72% dark chocolate to help cut through the richness and sweetness of the other layers. I used a bit more than 9 ounces of chocolate (9.1 ounces to be exact) because I am that much of a rebel. I didn’t refrigerate the Samoa bars overnight. I made them 36 hours ahead of time and didn’t want chocolate bloom. I’m pretty sure chocolate bloom only happens with pure chocolate and not ganache, but I still didn’t want to take that chance. At the 24 hour mark, the bars were yummy but kind of hard to cut. The caramel was bit hard for my liking, and I couldn’t help but wish for more caramel and less coconut. The bars were a different story at the 36 hour mark. The tender shortbread was a great base for perfectly chewy caramel and rich, creamy, dense ganache. I think some toasted sliced almonds on top of the ganache would add a nice crunch and even more depth of flavor. However, the bars are ridiculous to begin with, so an eater would be happy either way. Homecoming is stressful but unforgettable. And if you like your friends and Girl Scouts cookies and Indian girls who top their pasta with a marinara/Alfredo combo (who doesn’t? 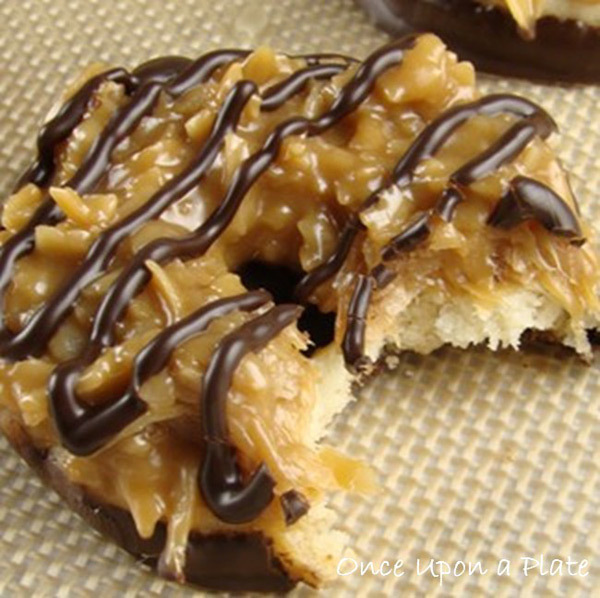 ), then you should make them Samoa bars. Cream the sugar and butter until light and fluffy. Beat in the egg and vanilla until well-combined. Gradually beat in the flour and salt until crumbly. Press into a 9×13″ parchment-lined pan. Bake at 350F for 25 minutes, or until golden and buttery/toasty smelling. Cool completely. In a large bowl, melt the caramels, milk and salt. Microwave on high for 3-4 minutes, stopping to stir a few times. When smooth, mix in the coconut. Spoon over the base; smooth the top. Cool until set. Heat the cream. Pour over the chocolate. Stir until smooth. Pour over bars. If you’d like, sprinkle some toasted sliced almonds on top (they add a great crunch). Refrigerate overnight, then cut into bars and serve.